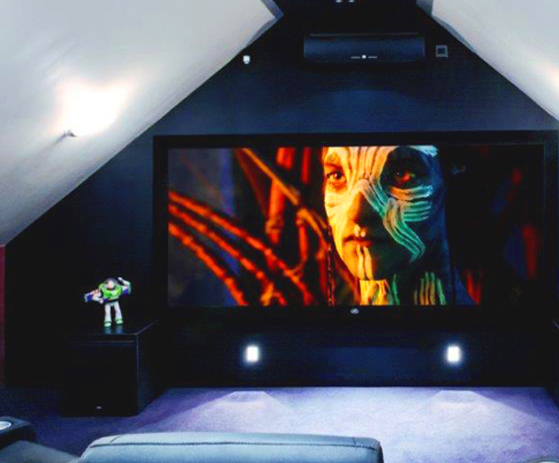 We were contacted by Fab audio to fit our stretched fabric system to this purpose-built loft extension. The client wanted a luxury feel to the room and to improve the listening environment. We fitted our 9mm tracking system to the front and back wall, lower sections of side wall and the central ceiling strip. The client wished for the apex to remain painted. We infilled our tracking system with acoustic foam and stretched a luxurious red velvet to the back and side walls and a black acoustically transparent fabric to the front wall and ceiling. There was a cupboard on both side walls, so we covered the four doors to tie in with the rest of the walls. We also created a buttoned panel to fit on the entrance door to really finish off the room with a luxurious look.